Why Wasn’t It Like This In August? Today it’s a beautiful summer day, though unfortunately I’ve had to spend most of it at a computer getting things ready to hang ‘East of the City’. Yesterday I did get out a bit, a few errands on my bike, then the annual attack on the eucalyptus tree in my garden, which would otherwise by now dwarf my house and be a fire risk. We got it as a present, a small tree, planted it and forgot about it for a few years, then were astounded at how big it had grown. Now I’m trying hard to keep it at the size I can trim it from a ladder, and yesterday I was up there with saw, secateurs and tree loppers. I’m not too keen on heights, and tend to dissolve into uncontrollable wobbles, but managed to stop myself falling off the ladder and get the job done, though I was exhausted by it. Then I came back indoors, back to the computer and put on-line the pictures from two days of walking beside the Thames at the end of August, when it was cool and rainy. The first day I had to wear waterproof trousers as well as a waterproof jacket and boots, though the second was rather better – just some heavy showers, and by the end of the afternoon it was really quite summery, a good excuse to go into a village pub for a beer. These were not particularly lengthy walks, though we did take several diversions which brought them up to around ten miles, and it’s too far for me to carry a heavy camera bag with all my usual kit. So generally I just take one camera – usually the slightly lighter D300, with the 18-105mm, as I did on both these days. Sometimes I’ll also add the 10.5 fisheye just in case I really need a wide-angle, but usually I don’t bother. I can’t quite say there are no wide-angle pictures when I don’t have a wide-angle lens, but on jaunts such as these I don’t feel the same compulsion to deliver effective images as when I’m working. I’d miss not having a camera with me at all, but these days are leisure (if strenous) rather than work. There is a kind of sullen colour that you only get on wet days that rather appeals to me, as in this picture of the river, though I find it hard not to be a little tongue-in-cheek when taking such views. 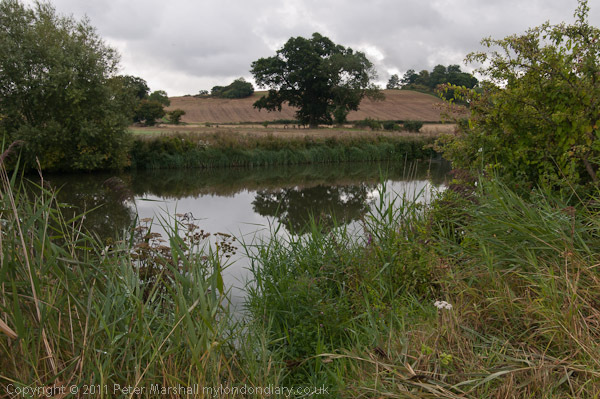 It was interesting when writing about the walks yesterday to take a look at some of the web sites about the Thames Path, not least to see how bad some of the photography on them was. Nowadays digital makes it so easy to take at least reasonable pictures, but some people do seem to have some special skill at not doing so. 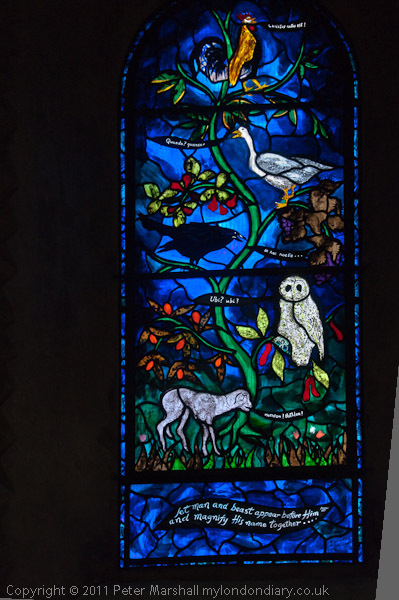 We didn’t stick entirely to the way-marked route, and one of the diversions was to Iffley Church, which was a fine stained-glass window by John Piper, who I think also took some good landscape photographs as well as his better known prints. I didn’t quite frame this with enough space around it to correct the perspective, but I think the picture captures some of the intensity of the original. The church is a splendid example of Romanesque, relatively little changed from when it was built, although it would perhaps have been rather more exciting with coloured paint on the fine stonework. 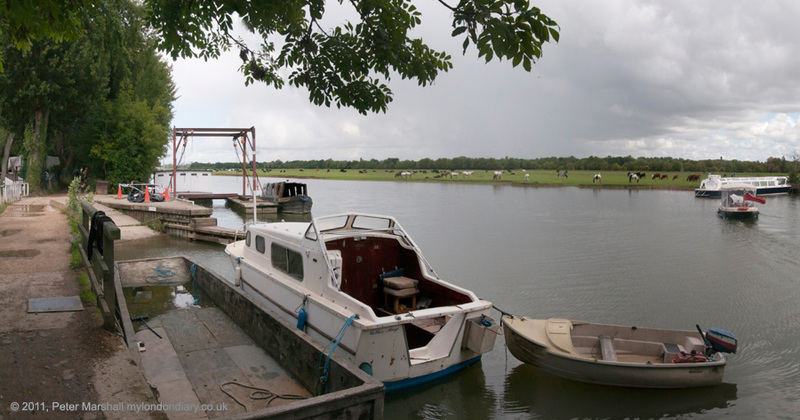 The following day we set off upstream from Oxford, and it started fine, but soon there were heavy showers. Later in the day it cleared up, and we had an interesting time in the village of Eynsham before catching the bus back to Oxford. Just after I took the picture above, I did have a wide-angle moment, and without a lens wider than the 18mm end of the zoom, the answer was obvious, and I made a few hand-held panoramas, each from just a couple of exposures. This is I think the best of them, and it has a horizontal angle of view of 95 degrees, just around the limit of rectilinear perspective. But the picture looks rather better when treated to a different projection, such as the Vedutismo (Panini) project shown here. You can probably see it twice the width if you right click and select ‘View Image’, at least that works for me in Firefox. 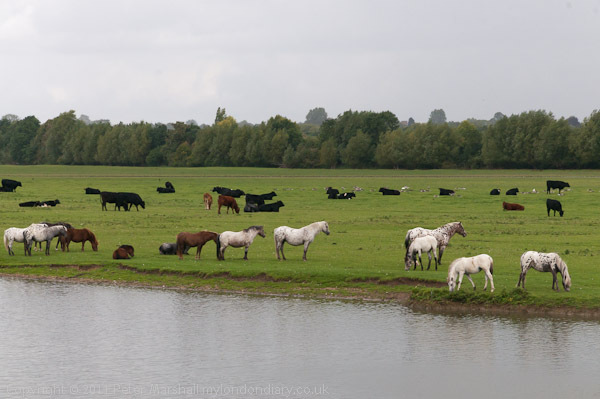 Thames Path: Abingdon-Oxford and Thames Path: Oxford-Eynsham. This entry was posted on Thursday, September 29th, 2011 at 02:47 pm and is filed under My Own Work, Photo Issues. You can follow any responses to this entry through the RSS 2.0 feed. You can leave a response, or trackback from your own site.